Coinciding with Animal tributes throughout the world, enter to win a chance to get a copy of Portland, Oregon’s pet artist’s animal painting used for National Dog Week. The painting is by pet portrait artist Donald E. Brown to honor the US nation’s 70 million plus dogs. Captain William Lewis Judy set aside the last week in September as National Dog Week in 1928 and coincides with many animal honoring traditions throughout the world. Singapore is having a National Animal Day September 25, 2011, and we are hoping to post some of their photos. 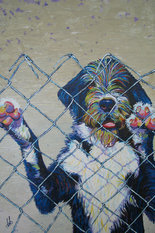 The painting offered by Donald E. Brown is of a dog named Sergio who had been living at the Baja Animal Sanctuary in Rosarito, Mexico, Brown’s charity of choice. If you like his work, just post a photo of your dog on the National Dog Week Facebook site and “like” it for the chance to win an original painting of your own dog. The “Canines on Canvas Contest will go through October 7th. A limited amount of hand-signed posters are avaiable for a purchase of $15. You can purchase unsigned posters afte those are gone. Brown hopes the original painting will be purchased by a donor, with proceeds benefitting the Baja Animal Sanctuary. Support National Dog Week at National Dog Week Facebook page. At this point in time, they only have 249 posts, so am trying to spread the word.